How Can I print Recipes on inHouseRecipes? Print recipes in print friendly format from inHouseRecipes. Printed recipe can be used as recipe card in your kitchen while cooking. It contains no clutter. How to Print your Recipes? Printing our recipe is easy as pressing Ctrl+P on your keyboard. The PRINT button available on left hand side of each article. Your browser’s File->Print will also help you print any of our recipe or page. All pages on our website are print friendly. This means that when you print, only the relevant content will get printed. It would automatically remove the advertisements, videos, comments, side-bar links, header – footer links and other sections on the web-page that you probably do not want to see. The images would be part of printing. This has been specifically kept as to help the recipe learner. The print command opens your computer’s print dialog box that you normally use. You will still have options to choose the print format, page size and other things that your computer offers. Can we re-distribute the printed article/recipe from your site? NO. You cannot re-distribute the content. All the content is copyright of inHouseRecipes.com and cannot be re-published or re-printed or distributed without prior written permission of inHouseRecipes.com.The print facility has been provided only your non-commercial and personal use. NO. You cannot re-distribute the content. 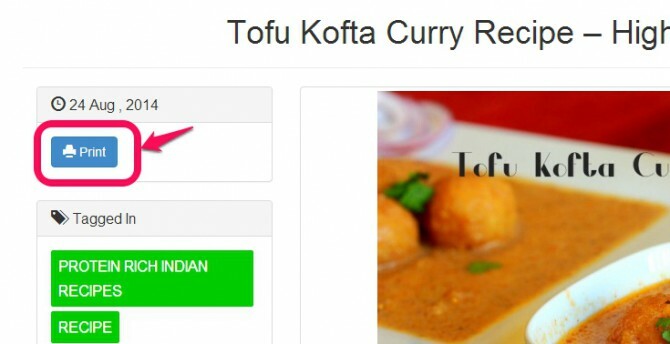 All the content is copyright of inHouseRecipes.com and cannot be re-published or re-printed or distributed without prior written permission of inHouseRecipes.com. The print facility has been provided only your non-commercial and personal use. Do you provide recipe cards? We do not have any specific recipe card format at this time. You can print the recipe as it is available on the web page. The format (theme) of the recipe would remain same when you print and we do not provide any option to customize the look and feel at this time. It is your choice if you want to use it as a recipe card or any other way in your kitchen. How many recipes can I print? You can print as many as you want. There is no restriction. The only thing to keep in mind that it is only a facility that we have provided for your non-commercial use.